Most 3D printers, use a system called fused filament fabrication which means extruding plastic (or whatever) a layer at a time fusing with the previous layer. The most important layer is the first layer, layer 0, the one that sticks the filament, not to previous layers, but to the print bed itself. The print bed can be various materials, for example the Makerbot has an acrylic sheet, and the Wasp has a glass sheet. In some cases the bed will have something on top of it, such as tape, or glue, and there is even a flexible mat that someone has made to allow the based to be removed, and flexed to get the print off the bed. It can be, err, fun, removing items from the bed cleanly - if stuck too well it can be hard to remove without breaking the printed item. However, if not stuck well enough the item comes detached during printing. There is also an issue that large areas of plastic can bend as they cool, so a heated bed is often useful too, keeping the material a little flexible until printing is finished. The Wasp Delta 20x40 has a nice heated bed with glass plate. However, with any 3D printer like this, one crucial step is ensuring the bed is level. I don't mean gravitationally level, though that no doubt helps, I means so that every point on the bed is seen by the printing mechanism as Z axis zero. When printing that first layer the extruder nozzle has to be just above the bed. Too close and you block plastic coming out. To high and the plastic just sit on the bed rather than being forced on to it and sticking to it. The tolerance here is very small. Given that you may be printing 100μm layers, the levelling has to be well under that in terms of accuracy. I have to say this is where the Wasp lets me down somewhat. Firstly, one wonders why you cannot simply make the machine with a fixed bed that is level. I guess, with such fine tolerances that turns out to be hard, fair enough. But what Wasp do is they have an adjustable bed - three knobs. And a process of move the head to key points and confirm it is just above the bed. Ideally you level just so you can fit a bit of paper between the bed and the print head. To be fair, this is what Makerbot do too. However, with the Makerbot the mechanism has a fixed carriage for X and Y, so the bed has to be level so that you can print without moving the Z screw drive. Moving in Z axis is slow on that type of printer. But Wasp is a delta printer - to move in X, Y, or Z you have to move all three motors. The levelness of the Z axis is a matter of mathematics. So you do not actually need a bed that is mechanically exactly level, you just need to measure where it is, and include that in the maths. This is one of the beauties of a delta printer. So, what they need is a sensor to check the position of the bed. A simple microswitch will do - this could be on the head itself if slightly spring loaded, or perhaps a probe that you flip in to place to measure the bed. The measurement could be totally automatic, checking the key points (3, to get a plane), and confirming other points fit, and the bed is indeed actually flat. I can't help feeling that the mechanical elements to make one contact sensor on the head would be less work and cost that making the bed adjustable and 3 knobs to adjust it. 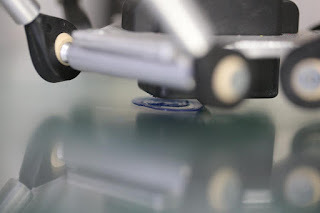 If the sensor does not need manually putting in to place, the process could be done automatically at the start of every print even. Please, Wasp, consider this in a future design. It sounds like you're after a Kossel Pro, a delta printer with auto levelling capability. No idea how much importing one into the UK would cost, mind. There's a pretty interesting blog post up here on the design work behind their self levelling probe. The RepRapPro Fisher auto-levels. It's not perfect but it gets the job done. RevK, is there a reason you did not go for an Open Source printer such as the RepRapPro Fisher Delta? As RogerBW says, it has auto-level - and being Open Source Hardware (and firmware/software) you are able to improve it easily too. I'm very happy with the RepRapPro Ormerod 2 I have, it's a very reliable printer and I found the support from RepRapPro was second to none when I had an issue.